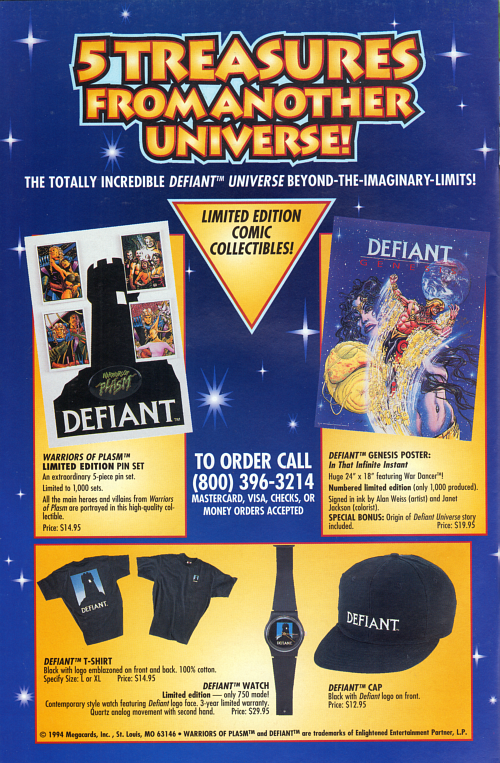 We have scattered threads on DEFIANT comics Merchandise. I may provide links to the other threads at some point. I wanted to consolidate the info to one thread so it'll be easier for everyone to find. The watch isn't of the highest quality. Especially for $29.95 back then. Has like a plastic band. The one I have doesn't work anymore. Cool item for Defiant history. I'm glad for this thread. Similar to a "Swatch" back then. They broke easily also. I once had a watch so cheap that it blasted apart when I was hitting balls at a local driving range. What a piece of crap that was! I don't wear a watch. Self winding watches wore out too quickly. Battery operated ones quit working as soon as I change the battery the first time. The seal would be broken and it'd get wet inside and die on me. I once failed my CDL driving test because I didn't have a watch! At the time when I first started with the bus company, I didn't have a watch or a cell phone, for that matter. I never wanted a cell phone, I always said if someone wants to talk to me bad enough, it can wait until I get home! The problem was without a watch or phone the tester said I had no way to time the air brake test correctly. My instructor had told me I would need a watch, but I forgot about it. Anyway, after being failed for not having a watch, I went right out to Wal-Mart and bought a cheap one. I also eventually had to cave and get a cell phone, as it is absolutely necessary to have one as a school bus driver, in case you have to travel somewhere that is outside radio range. I'm still behind on technology as I can be, as I still don't have a smart phone and still use my flip phone. I'm proud of you for holding out. Technology has gone too far. I too feel that if something is important, they can leave a message at home for me. I';ve never had call waiting either. If I'm talking to someone, I don't want to be interrupted. I have a flip phone that my girlfriend gave me on Valentines day in 2012 because she wanted a way to contact me if we are both one the road and trying to meet up somewhere. The phone is so worn now that the black color on the phone is coming off and you can see the components inside through the plastic. I only gave the number out to her and my mom. If someone asks fo my number I tell them that I don't own a phone. I consider it to be her phone on loan to me. I buy cards with minutes to refill the time. I don't have a monthly phone bill. It's odd at work. If I'm at my desk I won't get many calls. If I'm 50 feet away and crawling into a welded cabinet in a contorted position trying to measure paint thickness with a digital gage, 5 people will call me at 4 minute intervals. By the time I slither out of the cabinet (while avoiding metal brackets and shelves in the cabinet), the phone will quit ringing just as I go to pick it up. I hate phones. I don't call ahead to place food orders. I'm more likely to drive 5 miles and knock on a friend's door than I am to call them. Lol! I wouldn't have a smart phone now, but I'm dragged into whatever phone plan my girlfriend has.